Question: Do we use hormones (such as rBST) to increase milk production? Answer: NO, we never have and never will. We truly believe that good animal husbandry, good nutrition and lots of TLC make our girls happy productive cows! The girls have automatic grooming brushes, regular pedicures, their own nutritionist, charming veterinarians, comfortable mattresses and human interaction every day. They have freedom to socialize, eat, drink water or just snooze as they chew their cuds. They have curtains, thermostatically controlled fans and a heated milking parlor. Legal note: No significant difference has been shown between milk from rBST-treated and non rBST–treated cows. Question: Do we use antibiotics? This is the next most asked question. Answer: As you know, antibiotics do not promote milk production. I like to compare antibiotic use in our girls to antibiotics in your family. You would not just give yourself or your child antibiotics for no reason, and we don’t give them to the girls for no reason. By the same token, we would not just let one of our girls go untreated and die. If one of the girls is ill we call our veterinarians, they make a barn call and check the cow, make a diagnosis and prescribe the correct medication. Each medication comes with rules of usage. Any cow that has received medication is clearly marked with colorful leg bands and is put with ‘hold out cows’. The milk is discarded for the indicated time, then we have the milk tested for any residue before we reintroduce it back into the tank. The health of the girls is very important, healthy happy cows make the best milk!!! Answer: No we are not…pretty close though. In order for us to be organic we would have to take our fields out of production for 3 years. So we would not be able to grow our own feed, which is very important to us. 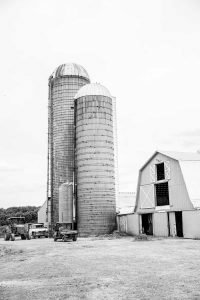 We would have to pay high prices for purchased corn/feed, and therefore our milk would be more costly and not truly home grown. Question: Do our cows go out to pasture? Answer: The girls can go out to pasture when our Michigan weather allows. Just like your grass at home it only grows for a relatively short period during spring and summer, tapering off as we go into fall. We bale our hay during the summer so that the girls have grass/hay during the periods of time that they cannot get to the pasture. Their barns are set up so they are free to socialize, eat, drink, lay on their beds (rubber mats with mattresses on top and covered in straw) and ruminate. They have thermostatically controlled fans and also curtains that are drawn during inclement weather. Question: Why do calves and cows look like they have earrings? Answer: The cows here at Calder are tagged with an identification number with their mother’s name on the back and their birth date. Question: What is a “heifer”? Answer: A heifer is a young female cow who has not had her first calf yet. After her first calf is born she becomes a cow. Question: How much does an adult cow weigh? Answer: An adult milking Holstein weighs between 1200 to 1700 lbs. They eat up to 100 lbs of food daily! Question: How many stomachs do cows have? Answer: Cows really only have one stomach with four compartments. Neat huh?! Each compartment does a different but very important job. The four compartments of a cow’s stomach are the rumen, reticulum, omasum, and abomasum. Question: What is this ‘chewing cud’ all about? Answer: Ruminant mammals such as cows regurgitate their food and re-chew it. Kinda gross but very handy! This helps them get the most nutrition out of their food. Cows spend a lot of time eating; they can eat up to 8 hours a day and chew their cud for another 6 hours! Question: What breeds of cows do you have on the farm? Answer: Here at Calder we have Holsteins (large, black and white), Brown Swiss (fawn brown and very stubborn), and Jersey (higher butterfat in their milk and are very opinionated for their petite size!). Question: Are cows teeth like ours? Answer: Cows teeth are different from ours. On the top front they have a tough pad of skin instead of teeth. They have 8 incisors on the bottom front, and 6 strong molars on the top and bottom of each side to grind their feed. Question: How much milk do cows produce? Answer: All farms are different but here at the Calder Farm each cow produces about 65 lbs of milk every day, which is about 7.5 gallons. That is an average of 2738 gallons per year for one cow!